I’ve said it before and I’ll say it again, eggs are my absolute favorite thing to eat for breakfast. I eat them at least five mornings during the week usually in the form of an omelet. When I’m not eating them for breakfast I’m snacking on them hard-boiled in the afternoon. I have to say though my favorite way to eat eggs for breakfast is in taco form. Ever since my first experience eating a breakfast taco on a trip to Austin some years ago, I’ve been obsessed. Who knew something so simple could be so amazingly delicious! These Egg, Green Chile and Cheese Breakfast Tacos are a recreation of one that I had during my last visit and I can’t get enough of them! I love starting my day with eggs for so many reasons. They keep me full longer than any other breakfast food, they taste delicious and they are a great choice when you want a healthy breakfast. Since March is National Nutrition Month what better way to celebrate than with the simple perfect little egg! I’ve recently started purchasing Eggland’s Best eggs because of their added nutritional benefits. Eggland’s Best eggs contain 10 times more Vitamin E, more than double the Omega-3, and 4 times more Vitamin D than ordinary eggs. If I’m already eating eggs I might as well get the extra benefits! I love that Eggland’s Best offers classic eggs, organic, cage free, liquid egg whites and even hard-cooked peeled eggs so there’s something for everyone. 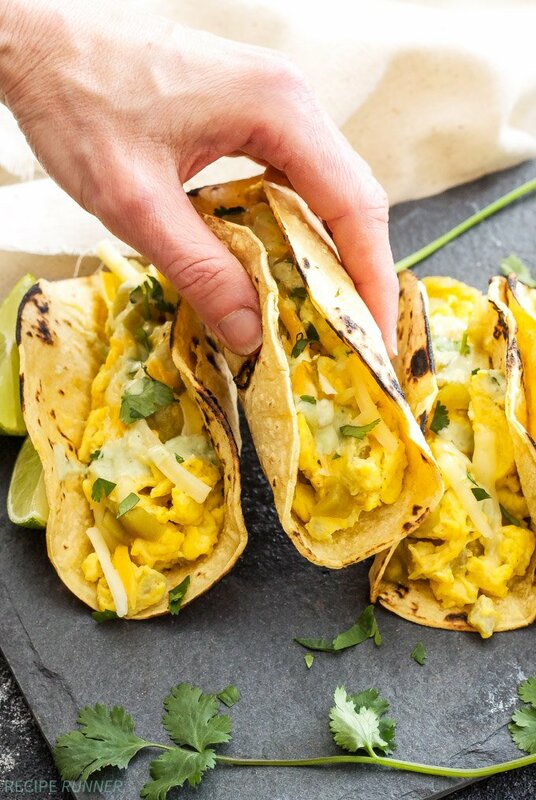 Making these Egg, Green Chile and Cheese Breakfast Tacos couldn’t be easier. For the filling all you need are four eggs, milk, diced green chiles, shredded cheddar and/or Monterey Jack cheese, salt and pepper and a few dashes of hot sauce if you want extra spice. Everything except the cheese is whisked together then scrambled in a skillet. When the eggs have reached your desired degree of doneness remove them from the heat and stir in the cheese until it melts. 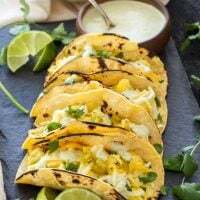 The filling is loaded into the warm corn tortillas and topped with a little extra cheese and the cilantro lime crema. The crema is optional, but it adds amazing flavor and reminds me of the breakfast tacos I had in Austin. 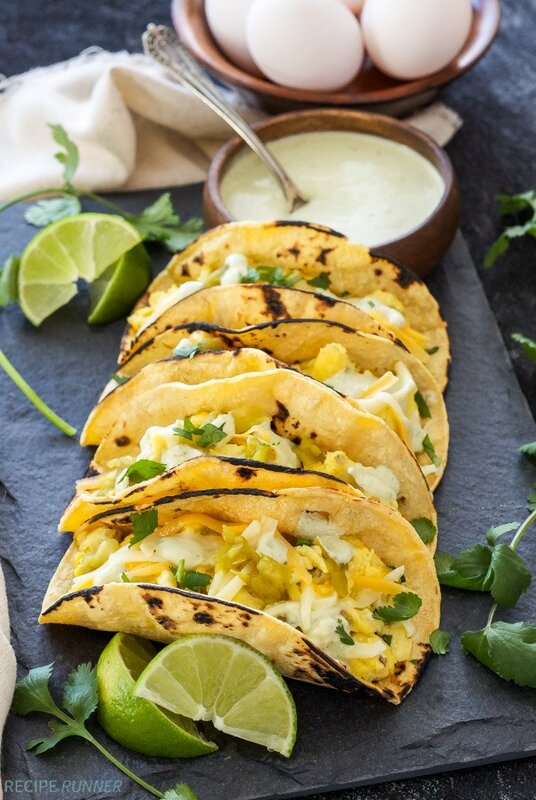 It’s made using Greek yogurt so it’s perfectly healthy to top the tacos with. 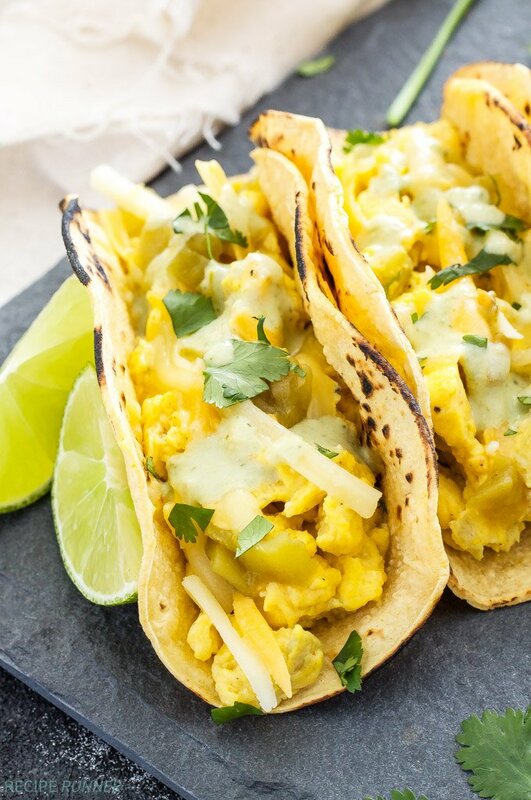 It can even be made a day or two in advance and there is enough to last through several rounds of these Egg, Green Chile and Cheese Breakfast Tacos. 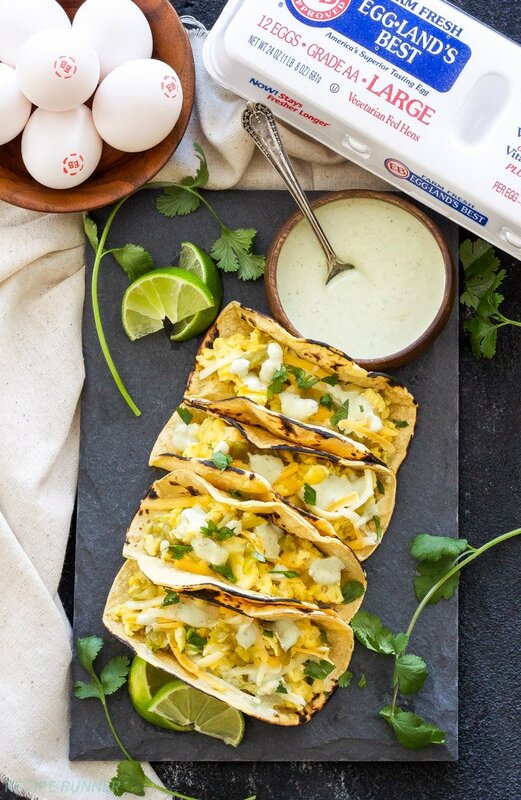 Change up your usual egg and toast breakfast routine and try making these fun and flavor packed breakfast tacos instead! In a medium sized bowl or glass measuring cup, whisk together the Eggland’s Best eggs, milk, green chiles, salt, pepper and hot sauce. Thanks to Eggland’s Best for sponsoring this post. As always all opinions are my own. Tacos are good any time of day, but they're extra tasty for breakfast! Thanks Catherine! Seriously genius! 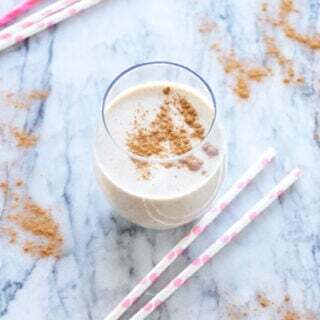 I wish I had the ingredients on hand to make these for breakfast! Danae, You have combined my love of eggs and Mexican in an irresistable dish. And that crema--OH my word!!!! Thanks Kristen! You can't beat eggs with some Mexican flare! 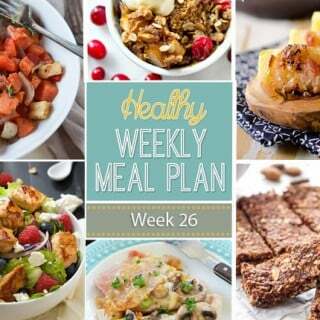 These look so delicious and filling! I'm new to this blog but I'm so happy I came here: breakfast tacos! What a great idea! Breakfast is best. Welcome Vivian and thanks for stopping by! Glad you like the breakfast tacos, breakfast really is the best! I'll bring the coffee if you whip up another batch? Yum! Great idea and the creama sounds delish! For some reason I never have had tacos for breakfast but you make it sound and look like a MUST! You must try breakfast tacos Thalia, they're life changing! We love breakfast tacos! I know these would be a hit at my house! Thanks Jessica! Breakfast tacos are the best! Love this! If eating tacos for breakfast, lunch and dinner is wrong I don't want to be right! Amen Karly! Thanks so much! Just made for breakfast. Family loved them. The sauce was a nice surprise and tasty. Glad to hear you and the family loved the breakfast tacos Reba! Thanks for trying them out.